Where to get Business Startup Ideas? https://canvanizer.com/wp/wp-content/uploads/2018/04/canvanizer_header-logo-300x91.jpg 0 0 Stefan Peter Roos https://canvanizer.com/wp/wp-content/uploads/2018/04/canvanizer_header-logo-300x91.jpg Stefan Peter Roos2018-04-04 11:49:052018-04-04 13:50:03Where to get Business Startup Ideas? We have prepared a step-by-step guide through the Business Model Canvas within Canvanizer 2.0, but you can still try it out in the demo. Click here for our Business Model Canvas Tutorial. The Business Model Canvas reflects systematically on your business model, so you’re freely to map each of its elements to your real business components. (That also means you don’t have to define or enter all of them). The following list and questions will help you brainstorm the precise idea for your next business model innovation. What activities are most important in distribution channels, customer relationships, revenue stream…? 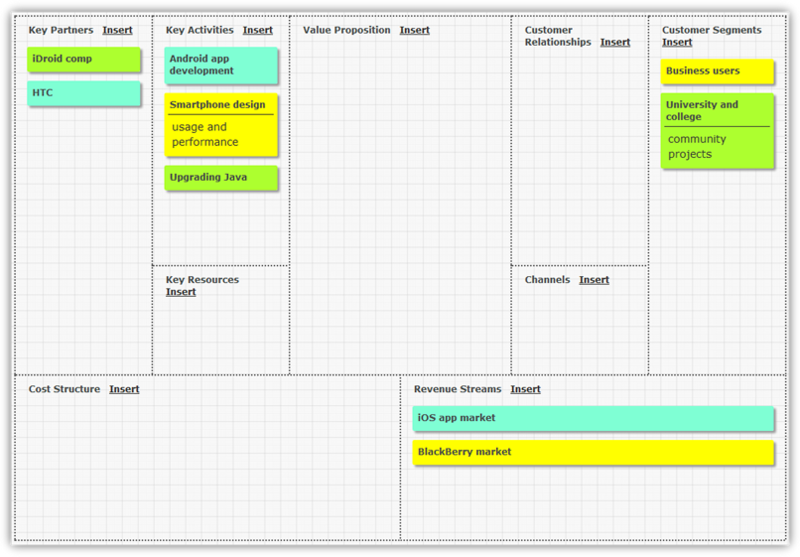 In Canvanizer, the business model canvas is followed prototype designed by Alexander Osterwalder. It is a ready to use web 2.0 pre-formatted canvas with the nine blocks of a business model as described above.